Camp runs Monday through Friday, from 8:30 a.m. to 3:30 p.m. Optional extended care until 5:30 is available. Campers have the option to sign up for a full week (5 days) or short week (3 days). If you select the 3-day option, you can choose which three days your child will attend. Every session includes an optional overnight campout, usually on Thursday nights. 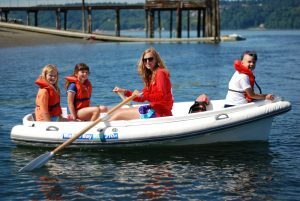 Camp Sealth is a 400-acre property with over a mile of waterfront located on the southwest shore of Vashon Island, about 2.5 miles north of the Tahlequah ferry terminal. We are not able to offer pick-up and drop-off, so transportation is entirely the parents’ responsibility. *Please note: Due to the travel time and ferries required to get to Vashon Island, we do not recommend registering for this camp unless you live on the island or are visiting for the week.